Determining what should be the first post on a new blog is rarely an easy task; should it be an introductory post? Perhaps not; there is, after all, an About page page to serve that function, if you’re so inclined to want to get to know me a little better. Rather than an introduction, I’d like to share an observation I’ve made concerning a verse in the King James Version of the Bible and King James Onlyists. Before we step into that verse, though, let me share a basic assumption I am making: King James Onlyists are not Calvinists. When I was a King James Onlyist, all of the resources and teachers which served to strengthen my loyalty to the KJO cult were also adamantly opposed to Calvinism. Cross-referencing to the Apocrypha — All the cool translations are doing it. You see, “all” has a variety of meanings, only a few of which require the word to refer to each and every thing, without exception. For instance, it isn’t a lie to say that you love all sorts of candy even if you dislike, as I do, chocolate-covered cherries. It isn’t a lie to say you’ve been in all sorts of trouble throughout your life, even if you’ve never hijacked an aircraft carrier. My point is that in natural usage, “all” doesn’t have to mean each and every. The fact of the matter is that to force such a meaning upon a word is to go against what is natural for the English language. So what does all of that have to do with 1 Timothy 6:10? Glad you asked! Taken at face value, with “all” meaning “each and every,” that verse becomes a lie: What did the love of money have to do with Adam [amp] Eve’s eating of the forbidden fruit? While the love of money is certainly at fault for millions of divorces, scandals, thefts, and murders, it is an injustice to the love of money to blame it for all of the world’s ills. John Calvin — Even his beard pointed toward the Word of God. King James Onlyists insist that this verse (and others like it) refute beyond any shadow of a doubt the Calvinist insistence upon a limited atonement or a particular redemption; how could someone teach that Jesus died only for an elect few when 2 Peter 3:9 declares that God desires all to come to repentance? then shouldn’t “all” also mean “each and every” in the case of 1 Timothy 6:10? In the first case, “each and every” creates a lie out of the verse by obscuring the truth that Jesus’ return is yet future only because there are still elect souls who have yet to repent. In the second case, “each and every” creates a lie out of the verse by obscuring the truth that the love of money is the cause of myriad evils. It seems to me that in order to be consistent, the King James Onlyist must either admit the looser definition of “all” that Calvinists use — which allows the King James Version translation of 2 Peter 3:9 [amp] 1 Timothy 6:10 to exist without problem — or they must admit that 1 Timothy 6:10 is a mistranslation. My leaving King James Onlyism was an uphill battle, but realizations like the above were great helps toward discovering the freedom that comes along with the knowledge that a multitude of translations are evidence for God’s preservation of His Word. Have you had experience with King James Onlyism? What sorts of things helped you find freedom from it? Are you an adherent to to King James Onlyism even today? What sorts of things have you convinced of its veracity? 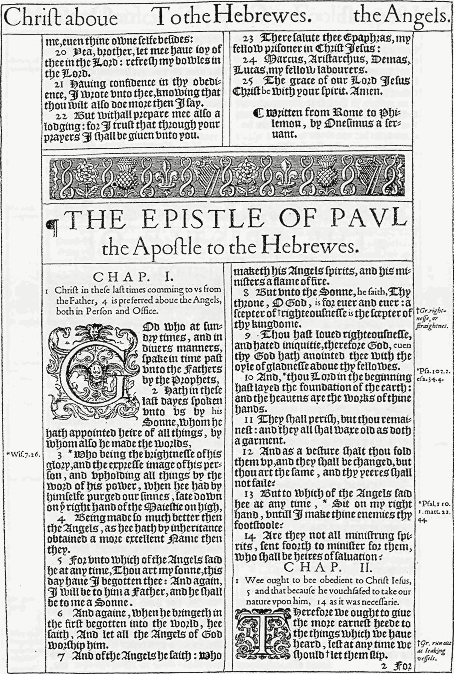 The image of a page from the King James Version is in the public domain and was found on the Wikipedia. Appearing on the page is a cross-reference to the apocryphal passage of Wisdom of Solomon 7:16. 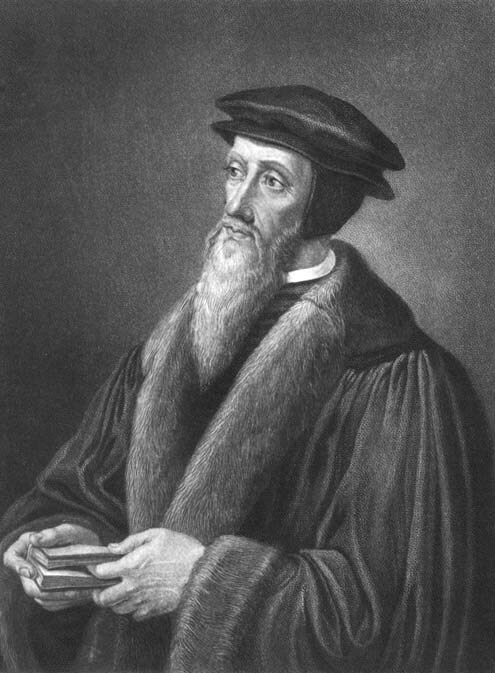 I’m unable to find any information regarding the picture of John Calvin used above; if you know who created it and when, please let me know.